You are probably wondering what the Bob and Elvis Party Bus is all about. 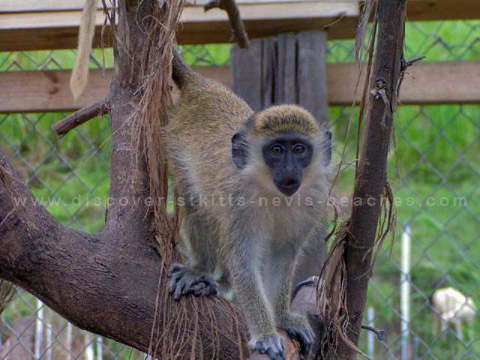 In short, it is a St. Kitts attraction that offers a party going, bar hopping experience by night, but is also available during the daytime for shore excursions and tours. The 'Tie Dye' painted party machine on wheels packs a well stocked bar, a DJ, sound system and a host who caters to your every need. The Party Bus crawls from the Caribbean Journey Mastrs Tour Shoppe at Island Paradise Complex in Frigate Bay on Wednesday & Friday nights for 4 hours of fun visiting Sugar City’s most unique and contrasting hotspots, including the beach bars at the Frigate bay Strip, Tony Berry's Heineken Shop and Ma Pau. But that is not all, the Bob and Elvis Party Bus is also available to transport you, your family and friends and even corporate groups to your special event, be it your destination wedding in St. Kitts or your company's convention or corporate event. The Bob and Elvis Party Bus is a modified Thomas International school bus that is outfitted with an on board bar and a PA/CD 100s watt sound system that plays the latest in dance and Caribbean music. The party bus takes you on an experience of a lifetime where you will go local and take in the action at some of St. Kitts' local bars and pubs. On board the bus, the bar never closes, so you will want to sample the special drink mixes. Don't forget to check out the tie dye merchandise (t-shirts for men and raglans for women) that is available for purchase on the bus. By now, I am sure you are wondering when the bar hopping party action takes place and how much it costs to get in on the action. 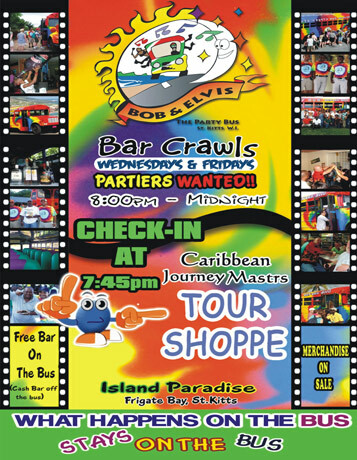 Well for now the Bob and Elvis Party Bus pub crawls take place on Wednesdays & Fridays from 8:00 pm until around midnight (check-in time at the Caribbean Journey Mastrs Tour Shoppe at Island Paradise Complex in Frigate Bay is 7:45pm), and the cost is just US$60 per person. They do offer group rates, so if you are with a group of six or more persons, be sure to ask about the discount that is offered. If you would like additional information about the Bob and Elvis Party Bus, please contact them directly using the form below.